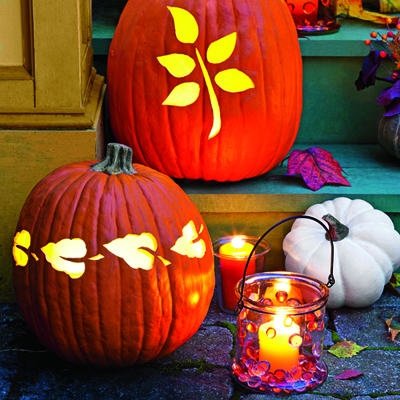 Halloween is just days away… how are you celebrating at home and around the office? Are you dressing up? Decorating? Diving into a big pile of candy? With all the mass-produced costumes (which almost always contain scary toxins and plastics, like PVC), endless candy wrappers, and an office cubicle or backyard full of store-bought decorations, this annual holiday can quickly turn into an extra-spooky one from an environmental standpoint… especially when it comes to the amount of waste that is created and often not recycled or reused for next year’s celebration. 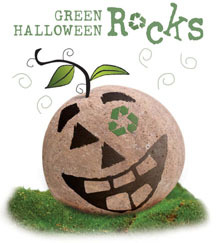 To make this year’s and all future Halloweens a little greener, here are a few sustainable “tricks” (or are they “treats?”) to try! 1. Make your own costumes and know what’s in your face paint! Store-bought costumes almost always contain non-recycled materials and/or toxic petrochemicals and plastic fibers that are scarier than Halloween itself! Watch out for PVC (polyvinyl chloride), which is a carcinogenic soft plastic material, and choose costumes that are made from safer, natural materials. Or, better yet, make your own costumes! 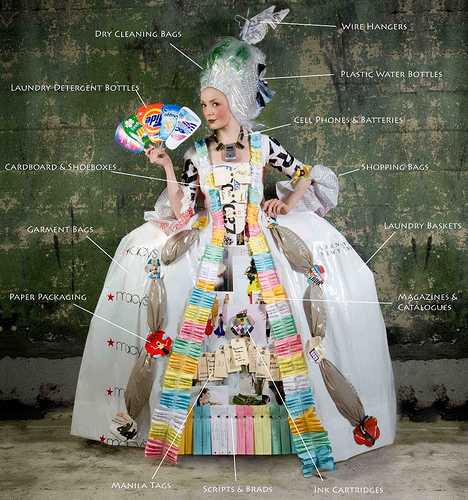 You can use recycled materials to craft your own costume, or you can head to Goodwill or a thrift shop and get inspired to construct a get-up that’s both economical and creative! Also pay attention to what’s in your make-up and face paint, too; toxic leads are found in a lot of costume make-up, and even fake blood can contain carcinogenic metals and icky chemicals that you and your kids will want to stay away from (you can learn how to make your own nontoxic face paint here! Hint: organic food coloring). 2. Choose Halloween candy (ideally fair-trade and organic) with the least amount of packaging. Natural, organic, and fair-trade candy and chocolate are the way to go; they are farmer-friendly, environmentally and economically ethical, and a much healthier choice. Candy is candy and sugar is sugar, but ingredients matter. Skip the high fructose corn syrup and Yellow #5 this year and go for the real thing that is made from pure and whole ingredients. Organic and fair-trade candy also comes in more environmentally-friendly packaging. 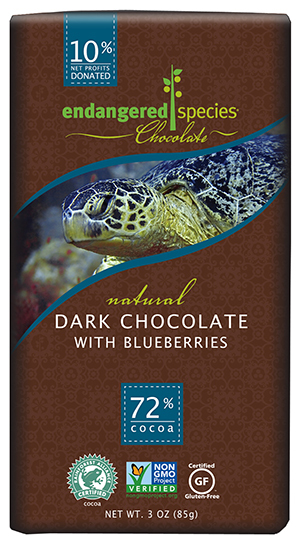 Our recommendations are Endangered Species Chocolate, Divine chocolate, and organic lollipops by Yummy Earth. If you’re really craving traditional Halloween candy and the pricier organic/fair-trade options are a little out of your holiday budget, at least buy your treats in bulk and choose candy that does not come in a ton of individual packaging— wrappers create a ton of waste! 3. Make your own decorations and Reduce, Reuse, Recycle— always. No more plastic pumpkins! Buy local, organic pumpkins instead, carve them up into unique jack-0-lanterns, and save the seeds and pulp for some yummy autumn recipes (like organic roasted pumpkin seeds or organic pumpkin bars). 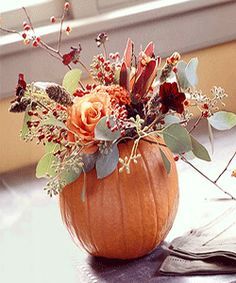 Miniature pumpkins, colorful gourds, or autumn wreaths made from nature are perfect for around the office and can provide a festive fall touch to your desk. Try some of these fun and awesome eco-friendly Halloween crafts and remember to use recycled, nontoxic, and eco-friendly materials whenever possible and arts & crafts products (paints, glues, etc.) that contain low VOCs. Lastly, remember to always save your Halloween decorations and costumes so you can reuse them next year!